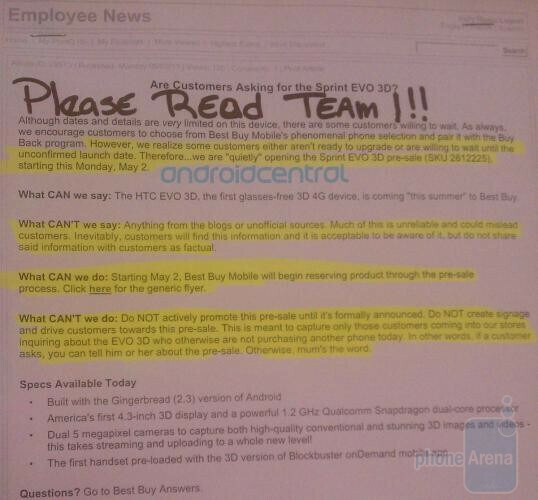 An internal memo circulating through Best Buy stores (on a need to know basis, presumably), states that the HTC EVO 3D can be pre-ordered from the big box retailer starting today. However, the pre-order is not being promoted and there are no signs about it being put up in the stores. Reps cannot mention the device until it is official announced. Customers must come into the store and ask about the phone and the pre-order in order to reserve an HTC EVO 3D. Otherwise, as the memo says, "mum's the word". So what do you get with the HTC EVO 3D? Well, right off the bat the device is powered by Android 2.3 and under the hood is a 1.2GHz Snapdragon dual-core processor. The EVO 3D has a 4.3 inch screen which gives you a good look at the 3D pictures that you can take with the dual 5MP cameras on the back. And, as the memo says, it is the first handset pre-loaded with the 3D version of the Blockbuster onDemand app. 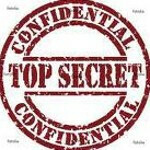 Remember, this is all secret hush-hush stuff. So if you plan on going down to your local Best Buy to pre-order the HTC EVO 3D, just remember to whisper. And to wrap things up, we still do not have a launch date or price from Sprint for the device. The HTC EVO 3D is expected to be released sometime this summer which means it will be at least another 6 weeks until you have the phone in your hands. Just don't forget to act surprised when you get it. can someone confirm if this is really true who lives near a bestbuy? Phil Nickinson at Android Central claims to have confirmed this. I will be going to Best Buy this weekend myself to verify. I am going to Best Buy right after work! If this is true I will let you know! Thanks Indoc and Superandroidevo. let me know when you guys verify it for yourself. Yes that is good news. I am about to get off in a hour! Best Buy here I come! how much you need to pre order?? What did you have and was it good? good deal, I just feel a little nervous about preordering a phone that i don't know the full price on. i'm cool as long as its not more then 300, how much did you have to put down for the pre order? Yes this is true. It can be pre-ordered though there are several details we don't know about the device... hence why it was an INTERNAL memo. We don't know the price, we don't know the date, we don't know how many we will get on launch, if any, and we don't know if all stores will carry them in stock. Saw this at CTIA. Not that big of a deal. After a couple of weeks I would get bored. No content and you have to look at it straight on in order to get the 3D effect. No need for 3D in a phone. You 3D-naysayers are funny... 4.3" 960x540 S-LCD display, 1.2GHz dual-core Snapdragon, 1GB RAM, 1080p video recording... You saw this phone at CTIA and thought it was not that big of a deal? Take away the 3D, and you'd be raving about it right now. Besides, aren't you the guy that said 10 years ago that there's no need to surf the web from your phone? I agree, the specs are where its at, this phone seems to have it all, including 3D. But how fulfilling is 3D on 4.3 inches. If you ask me, I would rather watch it on my TV. Pre-ordered mine today as well. Just make sure you have $50 to put down. They put the $50 on a gift card and give it to you, and you bring the card back when the phone arrives. I don't get too excited about specs. Oohhh, 1.2 GHz dual--core snapdragon (I'm not running autocad on my phone so it doesn't really matter. Let's face it, most people use their phones for email, browsing the web, and maybe playing a game once and a while if they are nowhere near their tablet, computer, PS3, WII, XBOX or whatever. The current 1GHz processor runs the phone just fine. I don't like the fact that you can't watch video that you recorded from your phone in 3D without sending it to a 3D capable TV and even when you do that you're watching it at 720p, not 1080p and you need the goofy glasses to watch. Watching 3D content on a 4.3" sceen isn't all that cool. I think I would feel silly, awfully silly if people were watching me sit there like a goof ball watching 3D on my phone. Don't get me wrong, this will be a nice phone but don't get too excited about the 3D or you will be let down. Yeh, honestly, the 3D part is kinda stupid to me...Im more so moved by the upgraded features, processor, resolution, battery, Sense, 2.3 Droid, etc. Yes it's true,I went after work. I was the first one on the list. If you get the phone less then retail at bestbuy then you are using your sprint upgrade. And pricing details haven't been released for the phone yet so noone knows if the cost purchasing through a sprint store will be more or less then the cost at a bestbuy. Hope a GSM version of the HTC EVO 3D will be available "this summer" too.